You are currently browsing the category archive for the ‘Need2Create!’ category. Yes. I’m a couple of months late on this beachy keen post. Even as I write this I’m thinking of fall, pumpkins, what to dress up for Halloween & wearing my Uggs, oh and apple cider doughnuts! Yumm.. So let’s take it back a bit. All the way to the middle of July. Schools out, the sun’s shining & the weathers warm. All we wanna do is hang out for lunch, have margaritas and enjoy the lazy afternoons….and it’s time to celebrate Paige and Wendy’s birthday! Something fun & colorful was a must! 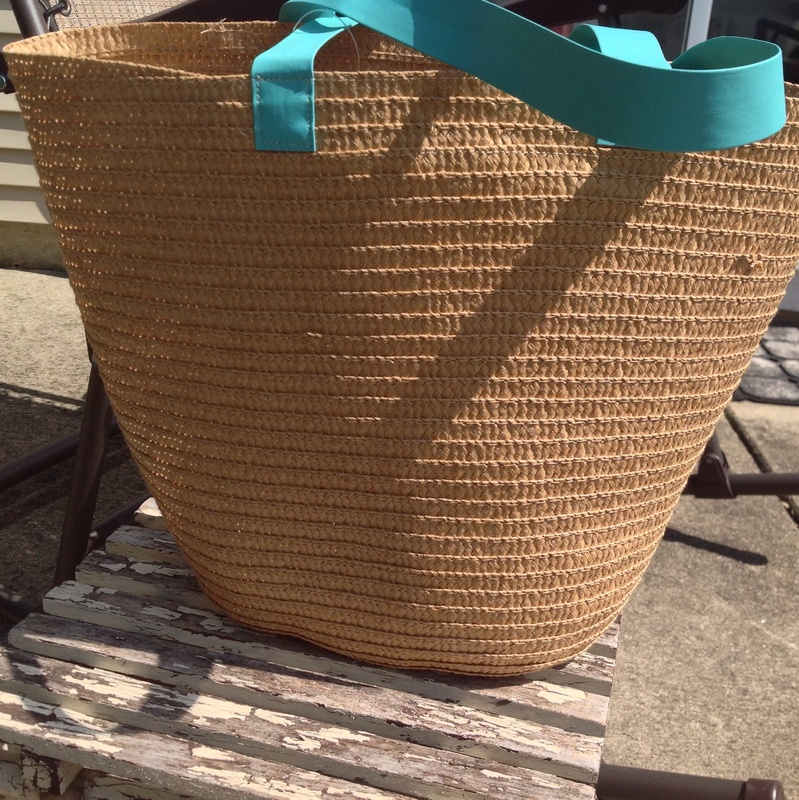 I found these totes out shopping one day and scored big time with the robins egg blue handles. I bought them, a lot of them, and knew exactly what I wanted to do with them. From that to this…nailed it, right?! 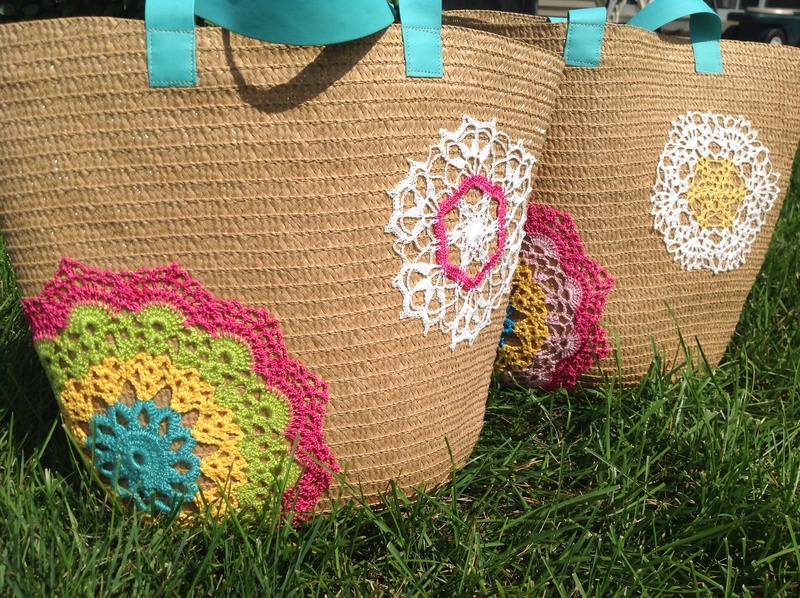 I embellished them with some bright and modern crochet doilies and flowers handmade for this project by my mom. 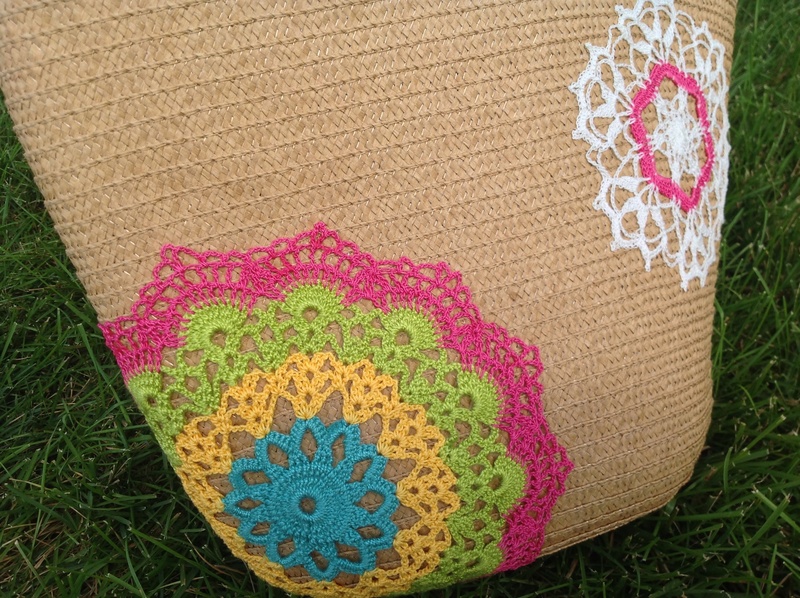 A bag to use as a purse for a day out shopping or to use as a tote for a fun take-along project! Wouldn’t these make great bridesmaids gifts too? I didn’t stop with the totes. 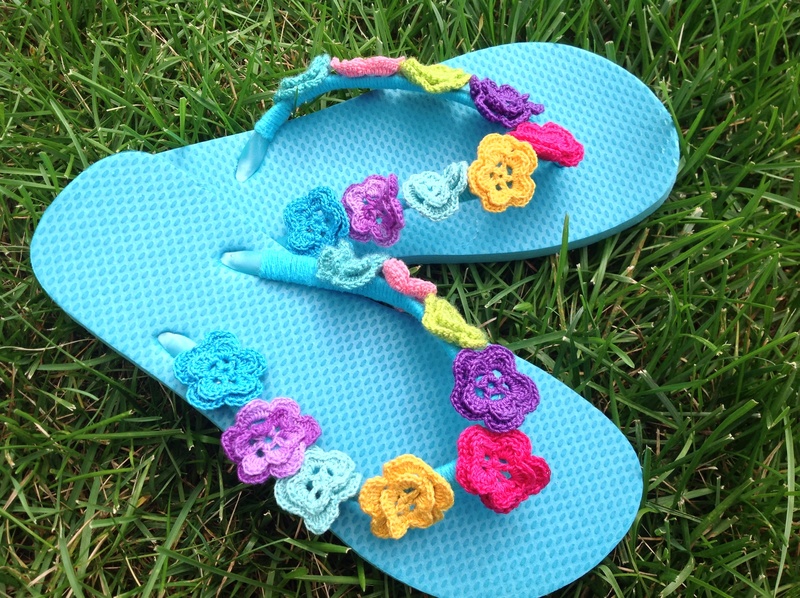 I took dollar store flip flops, crocheted flowers, and a bit of blue yarn..
and turned that into a sweet pair to be worn with white capris or a sundress. 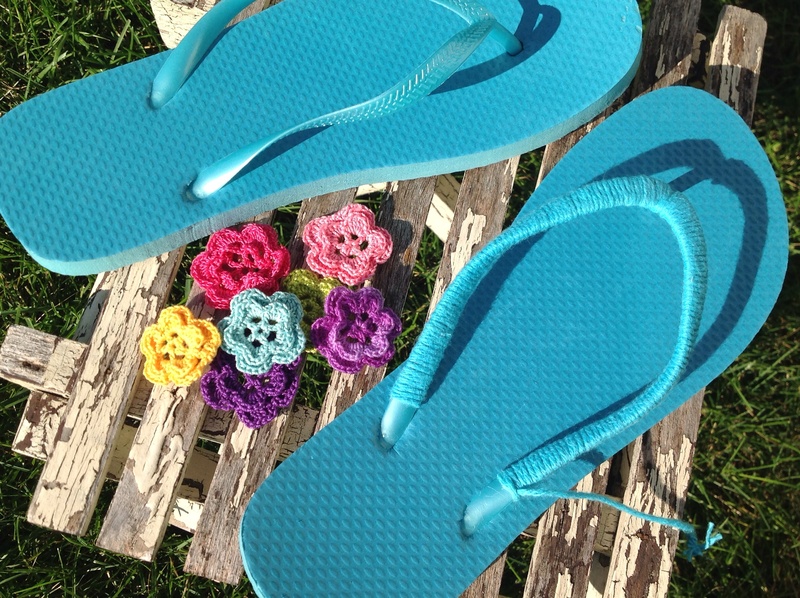 All I did was wrap the flip flops with the blue yarn and hand sew the flowers on…easy peasy! Toes to match;)..blue of course! I took so many feet pics I’m convinced my neighbors thought I’d lost my mind for sure this time. A huge thank you to my mom for doing the crochet. She’s always eager to help with all my ideas! Even as I write this blog, she’s working on another project for me. I get so excited when we can collaborate. We need-2-create! Isn’t it beautiful outside today? …well it was when I wrote this blog:) Sunny blue skies and mild temps make me wanna spend all my time outside while I can. 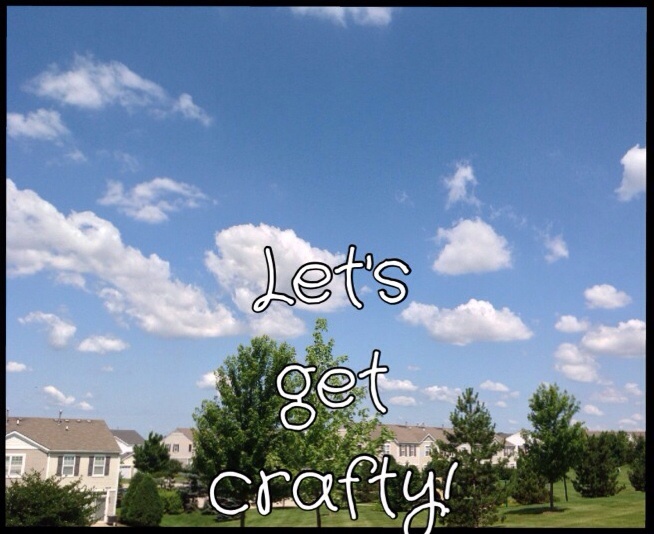 So today I took to the outdoors for a little crafting. I set up all my supplies on the patio, poured myself some sweet tea and enjoyed the weather while I created the sweetest little clock for my moms sewing room. 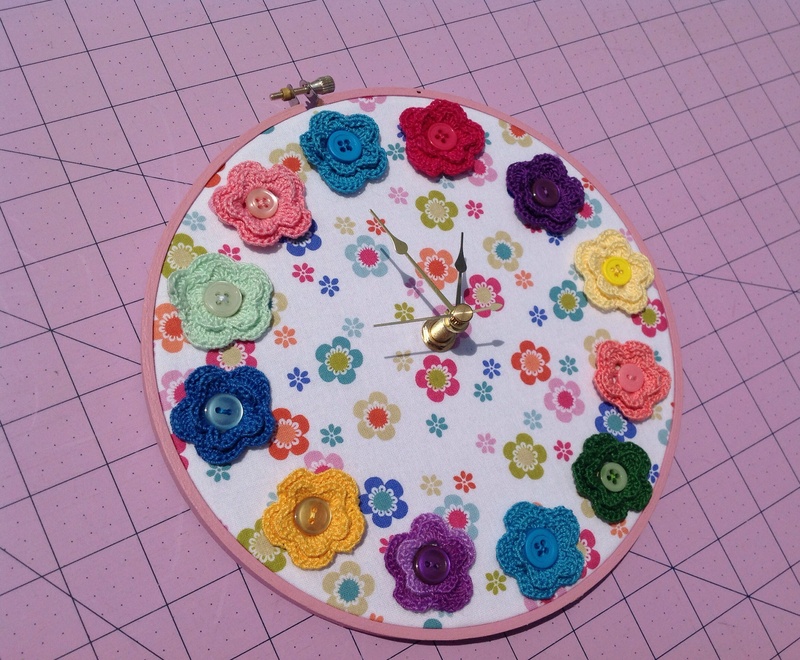 Today I’m going to show you how to make that adorable Button Clock that everyone has been pinning on Pinterest. 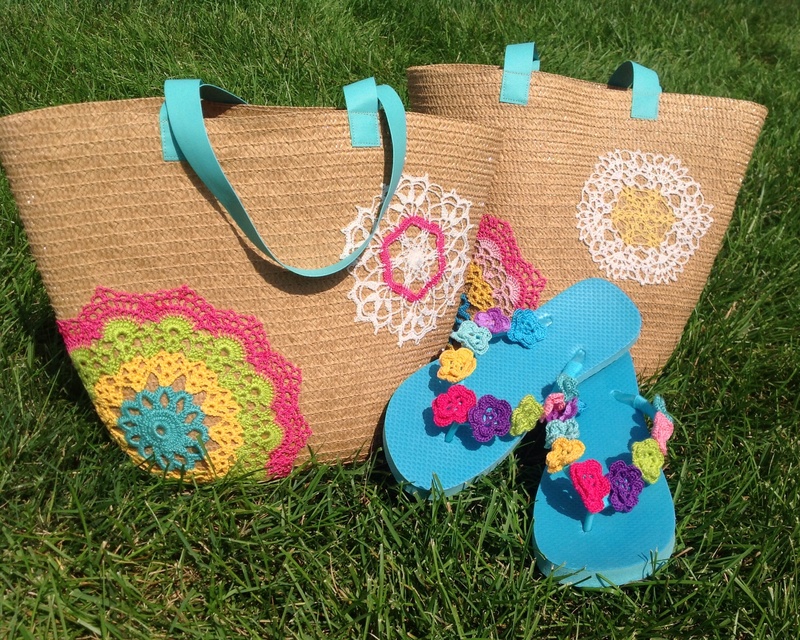 So gather up the supplies, beg your mom to make you some crocheted flowers and lets get crafty! Craft paint & brush, pink of course! 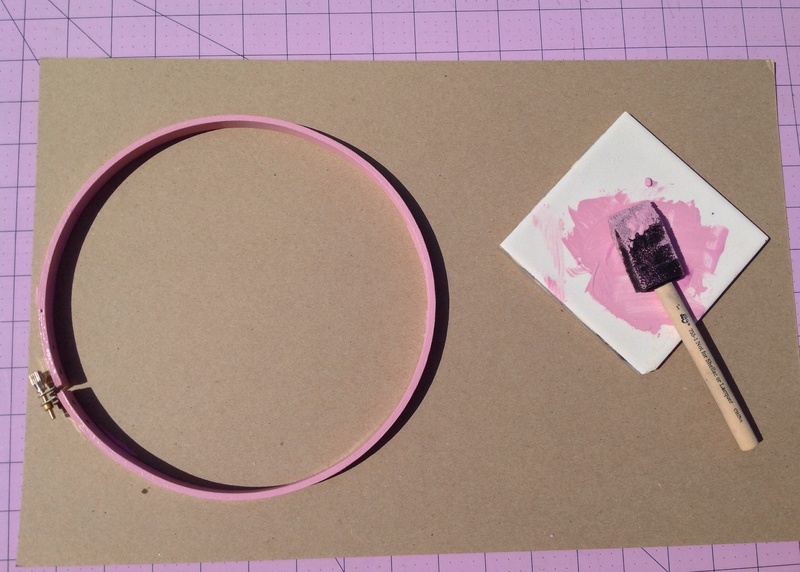 Start by painting your hoop with the craft paint and allowing it to dry. 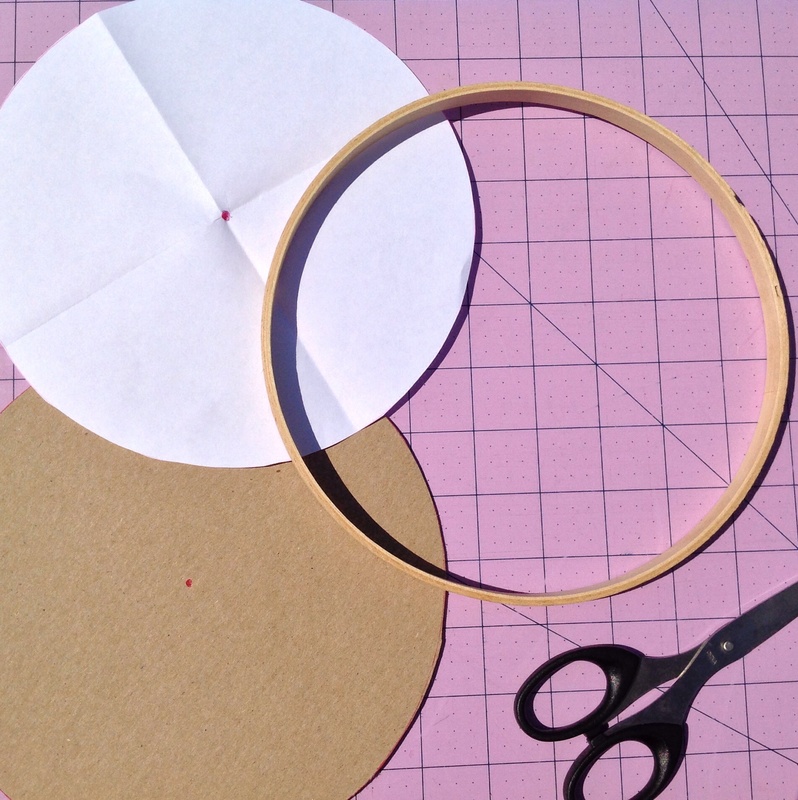 Trace the inner hoop onto your chipboard and cut out with scissors. 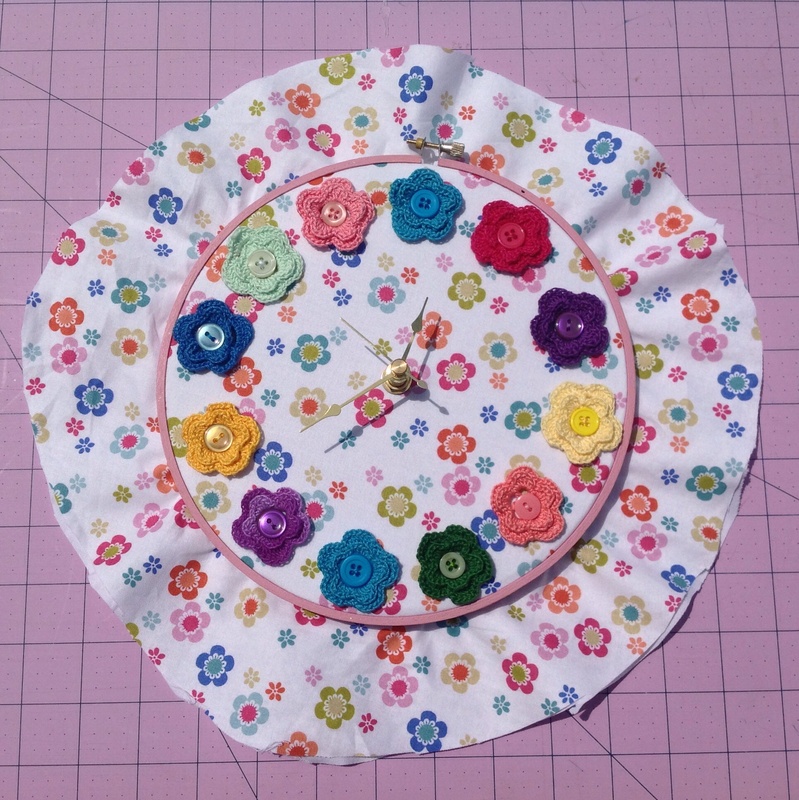 Place your lining fabric behind your clock fabric and tighten securely between the hoops. Make sure the fabrics are snug and secure by tightening the screw at the top of the outside hoop. 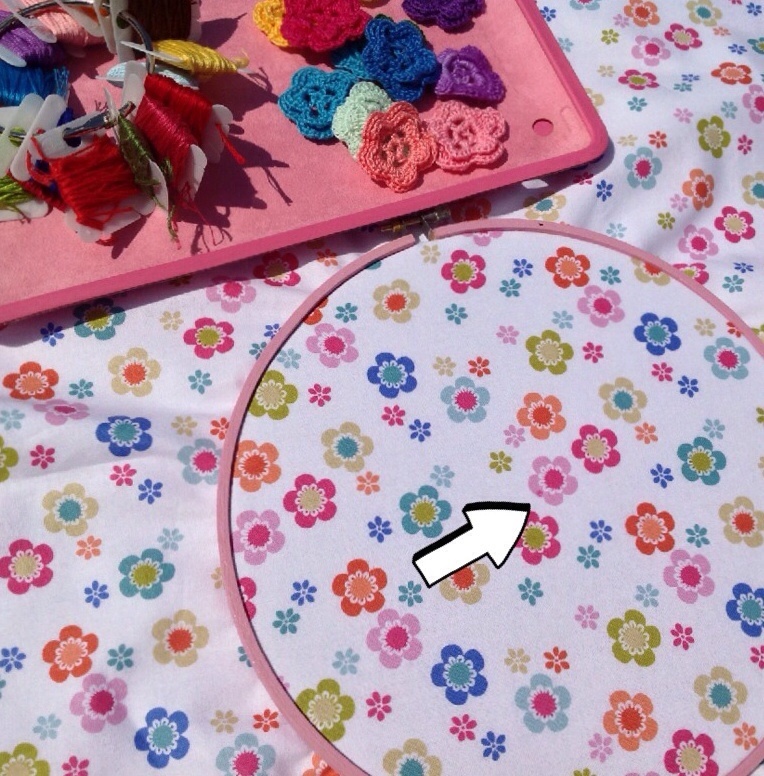 Place your paper circle on top of your hoop and mark the center of your clock fabric with a dot. This will be where your clock mechanism will fit through. Make a small hole with your scissors through both fabrics big enough for the mechanism to fit through. Now the fun part! 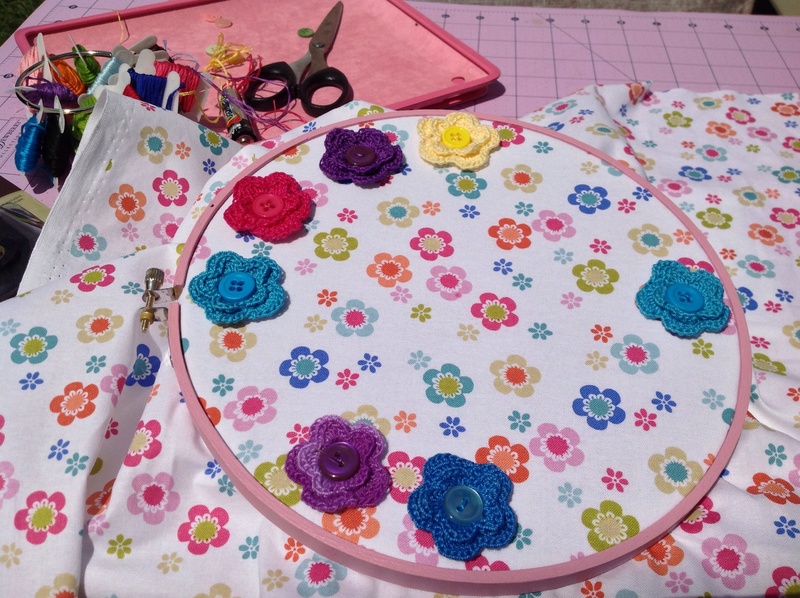 Attach your flowers and buttons with the embroidery floss. I started with the “12” & “6”. Then the “3” & “9” and eyeballed the remaining numbers. 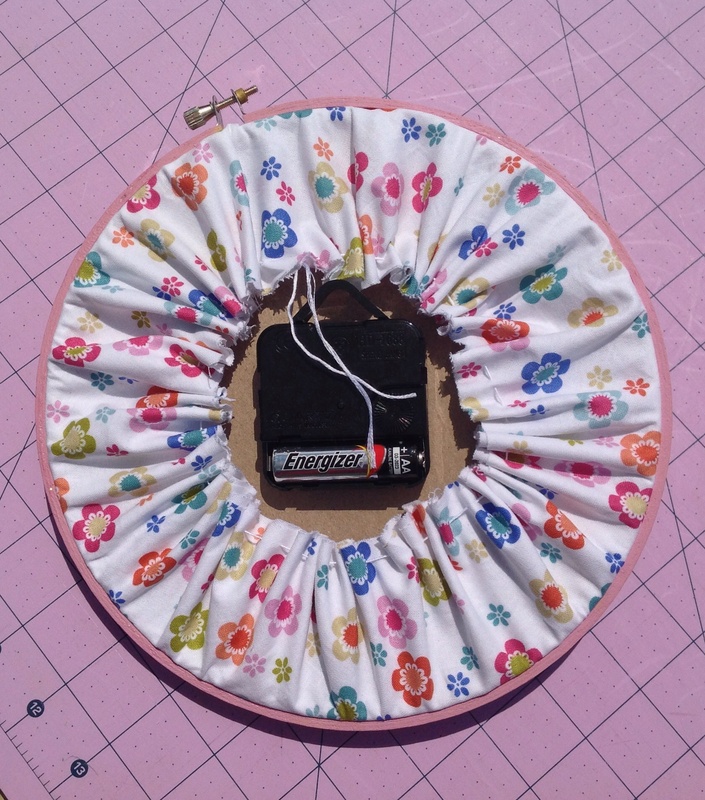 Once you’re finished sewing the buttons on, trim the piece approximately 2″ around the hoop. 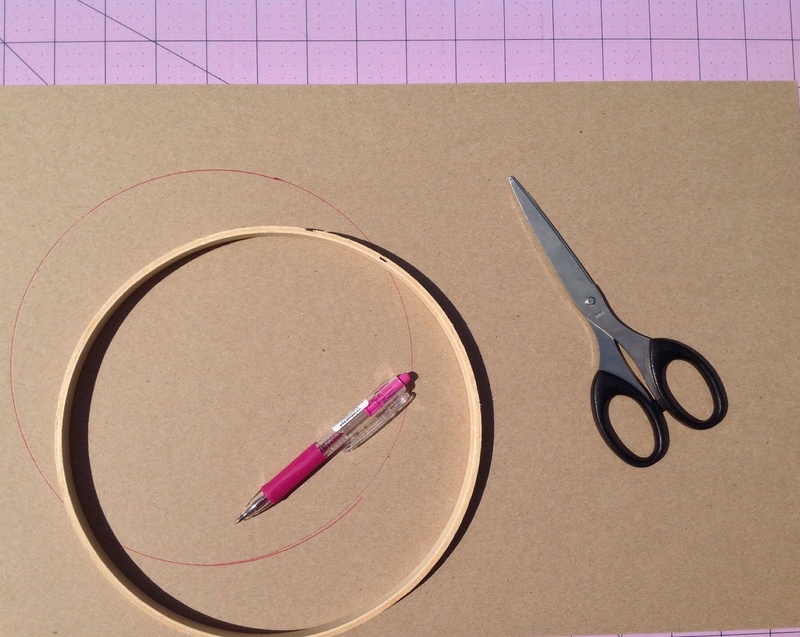 Add your chipboard circle to the back. This will provide stability for the weight of the clock mechanism. Using a piece of embroidery floss, create a gathering stitch in the fabrics. Pull and knot the thread in the back to make the edges ‘finished’. This will help the clock lie flat against the wall when hanging. At this point, most hoop art is then covered from behind for a nice finished look, but if we do that, we won’t be able to change out the clock battery now will we? 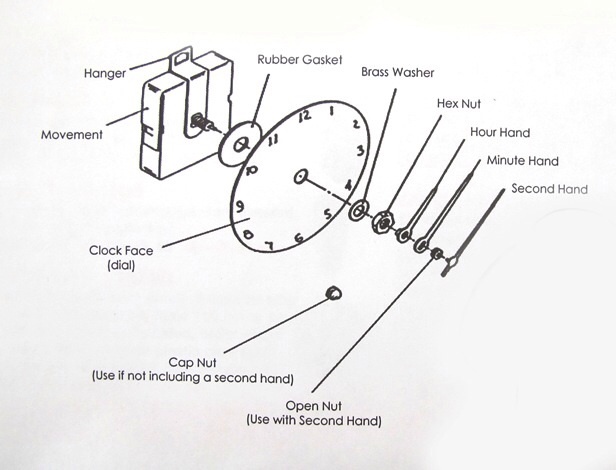 Add the clock mechanism following the instructional diagram provided with the packaging. Tip:Make sure to press down and get a snug fit with the ‘minute’ hand. Otherwise it will spin and loose time. I also removed the rubber washer because it created too much bulk and my clock still keeps great time. Add the battery, set the time and you’re all finished! Pour yourself another glass of sweet tea while you admire your craftiness! 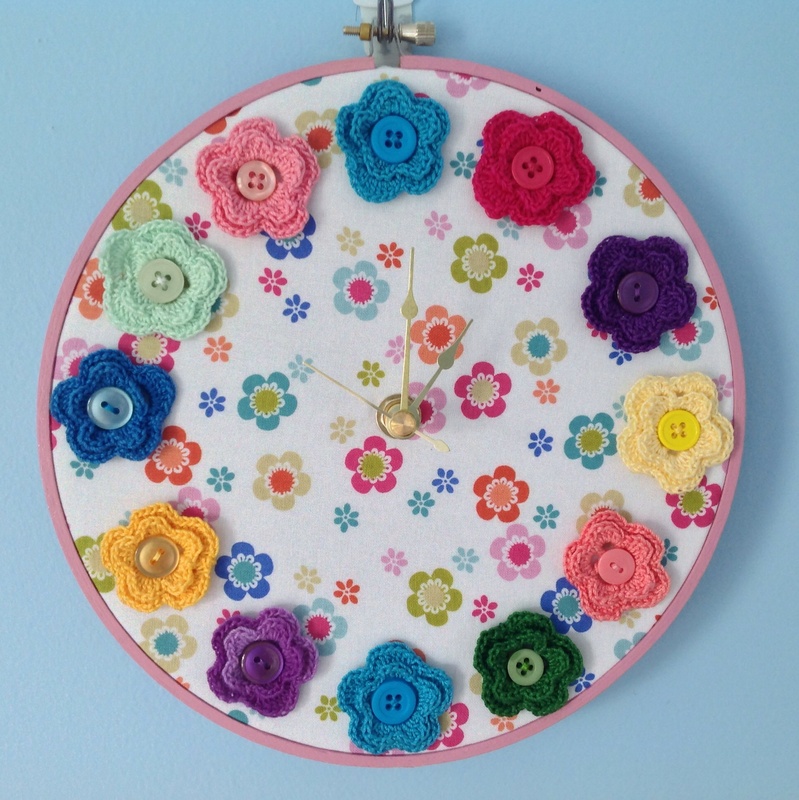 Love this sweet little button clock? Well you’re in luck because I’ve assembled the complete kit and they’re available in the SewMod Etsy Shop. 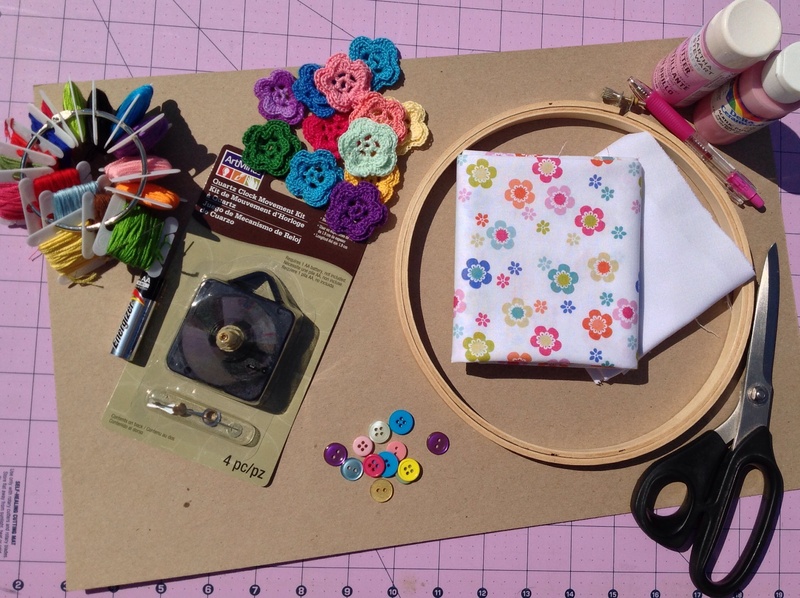 Kit includes the 2 fat quarters, crochet flowers, floss, buttons, chipboard, hoop, & clock mechanism for $25.00. Click on the SewMod link or convo me if you’re interested! 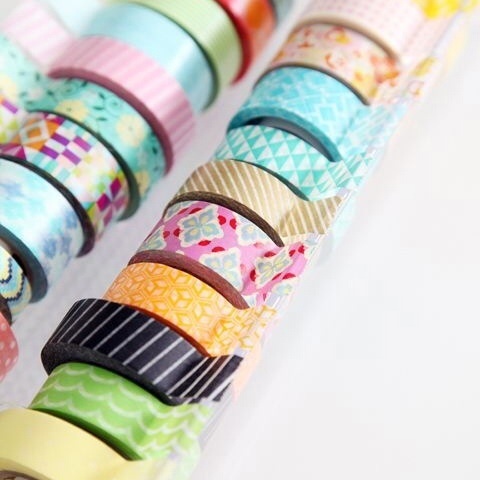 What the heck is Washi Tape you ask? Washi tape is basically a type of decorative masking tape from Japan made from rice paper that can be applied to all sorts of surfaces and repositioned. 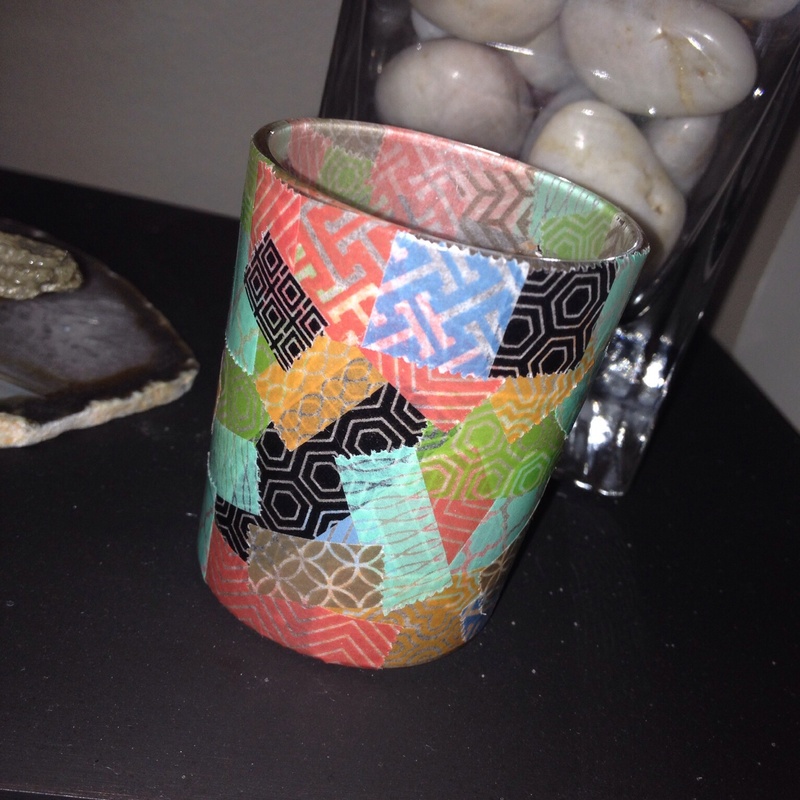 What should I do with Washi Tape? It’s all the crafty craze on Pinterest. I even have an entire board dedicated to the idea. Any surface is pretty much up for grabs! Decorate any glass or wood, light switches, vases etc. And since it can be repositioned, it doesn’t leave residue behind. We’ve even put different tapes on wine glasses at parties so we can keep up with whose is whose. Get the kids involved too. They love this stuff! 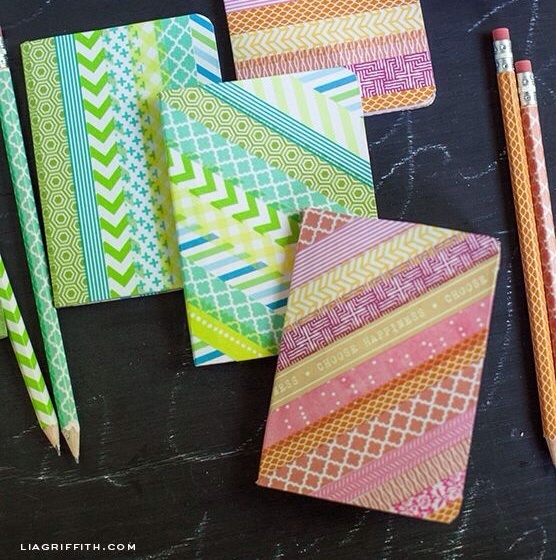 Let them decorate a journal or wrap it around their school pencils. We’ve found it on Etsy, Target, Michaels and specialty scrapbooking stores. The last tape I bought was from Target and the price was about $2.99/roll. Michaels was 3.99/roll but we’ve been using our 40% off coupon to reduce the price. The variety in the stores is growing each time I look. I do find Washi to be a bit expensive depending on the project. I can’t even imagine someone actually decorating a table or a wall with it. Aside from the cost can you imagine the time it took to do this? It’s awfully cute though, right? 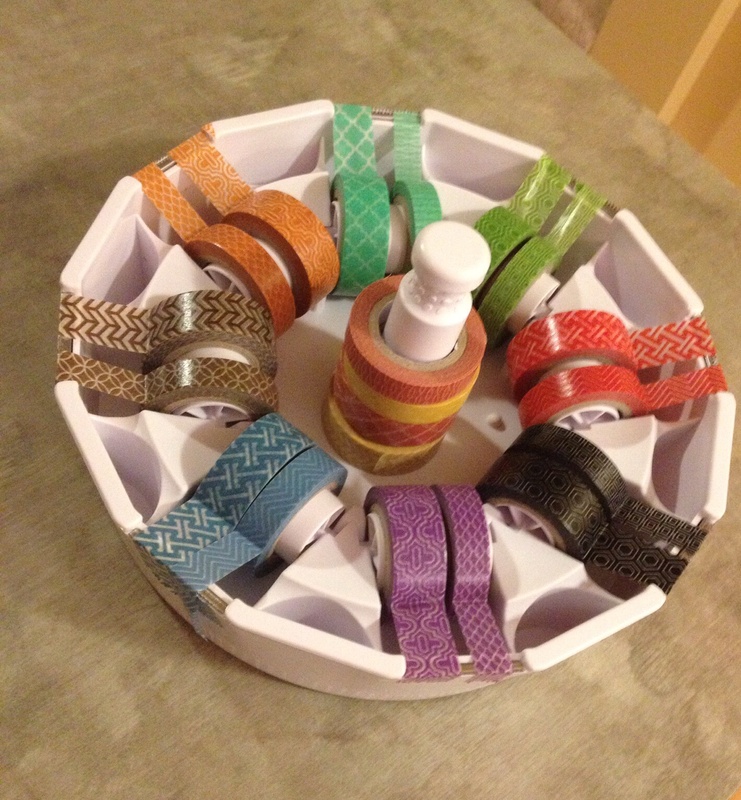 To keep your tape organized and handy, you can make your own dispenser made from a Saran Wrap box and tension rods. Find this clever tutorial at iHeart Organizing. This set was purchased at Costco during Christmas and comes with it’s own dispenser! And some of the tapes will fit your traditional desktop tape dispenser. What have we made with Washi Tape you ask? We’ve spruced up dollar store tea lights for the home and decorated some for Valentines Day. Clear votive candles. These were so pretty while they candle was burning. 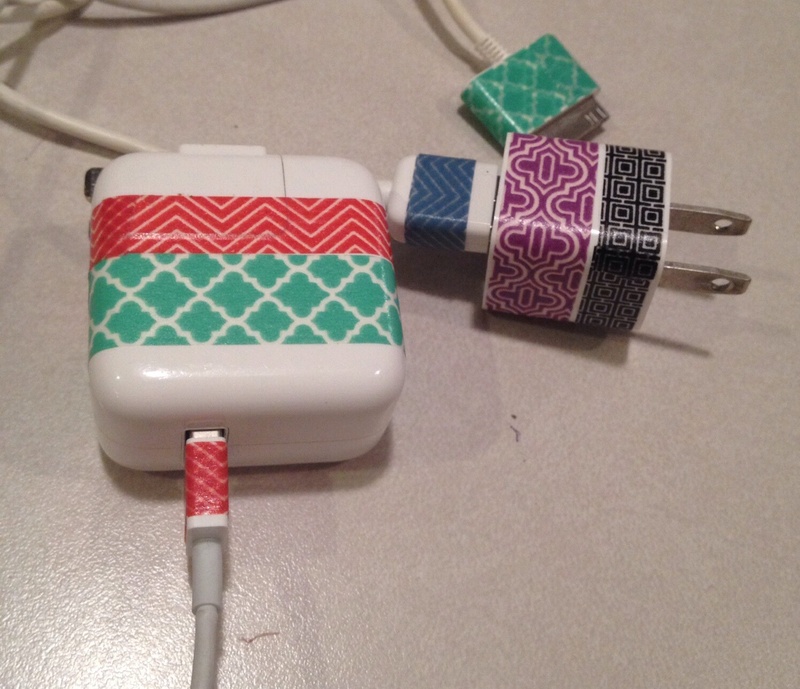 And even added some style to our Apple chargers! 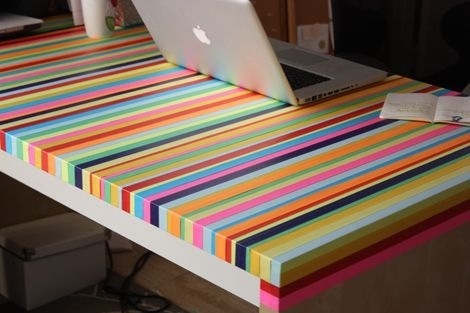 Check out my Pinterest board for more creative uses for Washi Tape. So tell us..What would you Washi?